And the hits don't stop! Moving right along, let's talk deep conditioners. 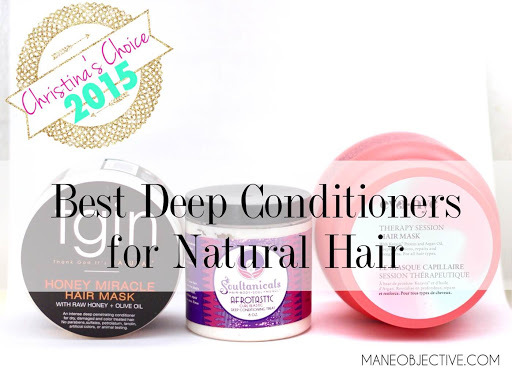 Of all the categories for Christina's Choice 2015, this was the most difficult to navigate because there are so many good deep conditioners out there. I mean heck, I still roll heavy with many of my picks from 2014. But I had to be honest with myself and admit that I don't keep a bunch of deep conditioners in rotation anymore. Sure, I may reach for them every once and again, and I may like them...a lot. But that doesn't mean they're holy grail status. They're good, but I don't particularly care to cuddle with them at night. 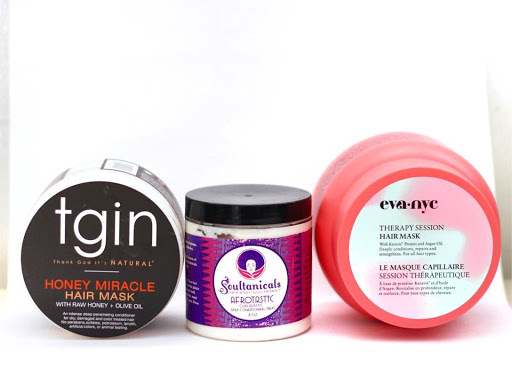 The three deep conditioners I'm getting ready to share with you? They get all the cuddles. Oh, what say you? You remember Honey Miracle Hair Mask being named as an honorable mention in 2014? Well, you remembered correctly! Honey Miracle Hair Mask got a promotion -- and a well-deserved one, too! My transitioning and "naked" natural hair days had me fiendin' like a fool over the Triple Moisture Replenishing Conditioner (don't worry I still love it...it's just not HG anymore), but with my hair having been colored red at the tail end of 2014, and again to black a few months ago, more moisture was on the menu. Enter: Honey Miracle Hair Mask. Not only do I absolutely love the sweet, floral fragrance, I'm head over heels with the richness and intense moisture it provides. It has amazing slip, and leaves my hair shiny and buttery smooth -- y'all know I live for the buttery smooveness. It sounds like I need to do an updated review on Honey Miracle Hair Mask but in the meantime just know -- it's delicious down to the last drop. "How, Sway? How is a deep conditioner I've never seen Christina talk about on Instagram or on the blog, or anything be holy grail? Like, how?!" I'd now like to take this time to apologize for being a bad blogger. See, what had happened was....lol. But seriously, I've had Afrotastic Curl Elastic since mid-2015, and I've been using it on the low ever so conservatively -- for fear of running out. Luckily for me, a little bit of Afrotastic Curl Elastic goes a long way, so I won't run out before my next order arrives. Now, let me tell you a little bit about this jar of tropical passionfruit candy scented goodness. Clearly, it smells amazing. But beyond that, it's a nutritional powerhouse for hair that needs a little extra TLC. The water is botanically infused with marshmallow, rosemary, burdock root, amla, sage, and more to strengthen hair at the roots and stimulate growth. Pro Vitamin B5 and Hydrolyzed Jojoba Protein strengthen and fortify the hair, while Ximenia, Olive, and Avocado deeply moisturize and smooth rough cuticles. I'm going to do a full review on Afrotastic Curl Elastic SOON, but in the meantime just know it's 137% fire! You know those deep conditioners where after rinsing your hair, it feels stronger, more fortified, and like it soaked up alllll the goodness? That's my hair on Afrotastic Curl Elastic. My strand feel buttery to boot, and the slip is off the charts! Talk about a win all around! So now you see why it's on my list, right? Two years in a row, baby! Eva NYC Therapy Session was literally love at first jar, and I'm easily about 9 or 10 jars in -- just ask the folks at Ulta in Redondo Beach. I'm still not wild about the fragrance (it gives me powdery grandma teas), but I love it nonetheless. The slip, the buttery smooth realness, and everything else it does for my curls. Plus, the hefty, almost 17oz jar will last you a mighty long time if you use it right. I don't think I need to do much more convincing on this one, I've probably shared more about Therapy Session Hair Mask on the blog and Instagram than I have for any other product (except maybe Bae Clean). Why: Yassssssssss! I mean, what?! I told y'all there would be some upsets this year, and here's the first one! The greatness of Afrotastic Curl Elastic is just too much to ignore. It hydrates, foritifies, strengthens, and nourishes in one fell swoop. It gives me buttery smoothness and strength, all in one. Here's how you know I'm for real for serious about Afrotastic Curl Elastic: my re-up order is salon sized. Yes. 33.8oz of curl-loving realness is en route to my doorstep, because it's that good. Oh, and by the way (I'm not getting paid to say this or anything), but if you're interested in trying it out for yourself, Soultanicals is having a 50% off End of the Year Sale on their entire site (use code EOY50 at checkout). I just looked because I was gonna link Afrotastic Curl Elastic for y'all, but it looks like the 8oz, 16oz, and salon size are out of stock. But that proves my point though! This stuff is baaahmb! Plus, there's always Amazon. 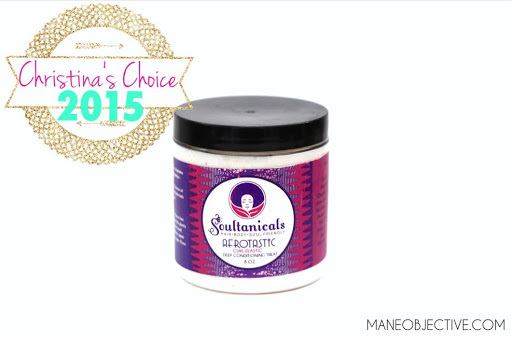 What deep conditioners are winning with you as we go into 2016? Let me know in the comments below! Up next: treatments for damaged hair! Yasssss, a NEW category! I've been loving True by Made Beautiful Intense Treatment Masque! You did a great review on it & I got my mitts on it a month ago and I'm completely in love with it! It also doubles as a styler for me! It's a total Holy Grail/Deserted Island winner for me. It made my Eden Bodyworks Curl Defining Creme come second place. Yasssss!!!! It's SO good! Thanks for checking my review! I wanted to include it on my list, but I had to be honest -- I didn't use it all throughout 2015, and I reached for all of those here by default. There's always 2016! Oh and that Eden Curl Defining Cream?! Super hot fire!!!!! Soultanicals could put air in a jar and my hair would love it. I've been riding with them since '13 and everything I've used I liked or loved. I was all about Shea Moisture conditioners, but, after trying Afrotastic this year I had to push them to the side. It just melts into my hair and leaves it so nice. I have an unopened 8 oz with a 16oz on the way because I don't want to be without it! Their Molasses deep conditioner is bomb too! GIRL! You ain't NEVER lied! Fluffalicious and Curl Blaze were my transitioning JAMS! That Molasses DC smells sooooo good. But Afrotastic has my heart. I can't wait for my salon size to arrive! Nowadays, Hair Fall is a very big problem for lots of people.So be careful when you choose any hair care products because sometimes it may give worst result.